Where truss designs require bracing to be applied to webs, this can be achieved by the use of longitudinal ties, T-stiffeners or other supplementary members. Where longitudinal ties are used, they shall be a minimum of 70mm x 35mm F5, or as specified in the design specifications. The web ties shall be fixed to the web of each truss at even spacing of the web with two 75mm x 3.05Ø long nails and braced to the truss with one bay of crossed steelbrace at each end and an intermediate bay at 10m centres. 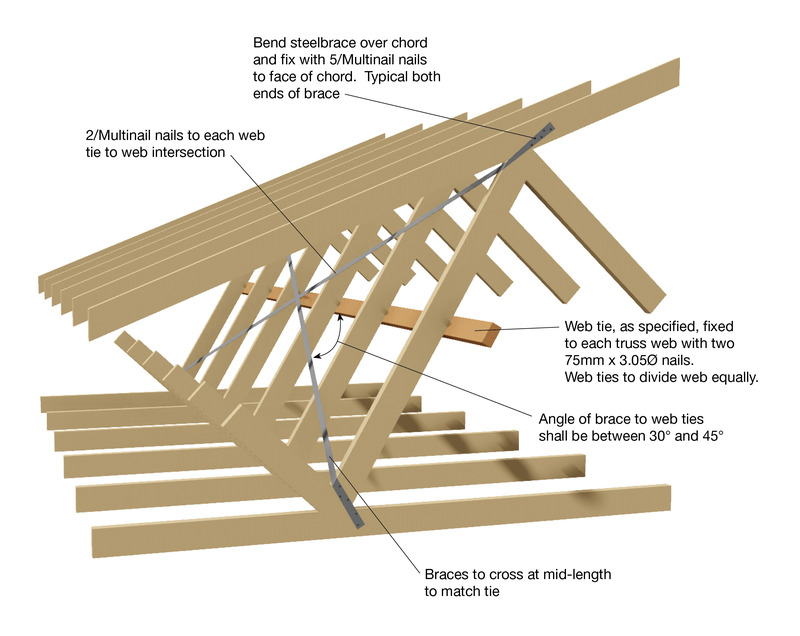 Web ties shall be continuous or, where required, spliced by lapping over at least two adjacent trusses.